Every once in a while you’ll see a story about an art discovery. Someone found a medieval tapestry in her grandma’s attic, for instance, or someone else paid 15 bucks at a yard sale for a painting that turned out to be a Renoir. Something like that creates a brief flurry of excitement, but those finds pale in comparison to the lost art that was literally unearthed at Xi’an, China, in 1974: an army of life-sized statues had been hiding underground for two millennia. Some local farmers were digging a well when they started finding pottery and bronze weapons… and then fragments of warriors that had been sculpted from terra cotta. (That’s an Italian term that means “baked earth” — fired clay, in other words.) The farmers told the authorities what they had found; soon the site was swarming with archeologists and technicians who took over the excavation with their own fancy shovels. It was determined that this brigade of statues dated back to 240 B.C. or thereabouts. 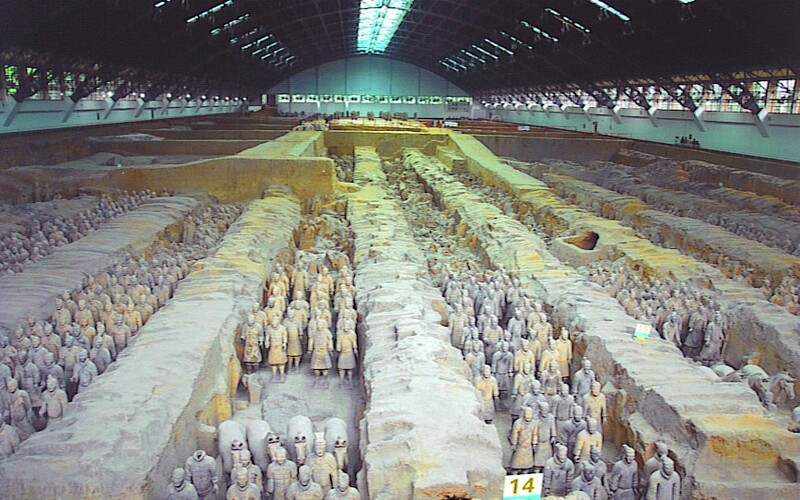 The experts realized that the terra cotta warriors were part of the burial site of Qin Shi Huang, the first emperor of China. Qin (pronounced “chin”) had ordered up these foot soldiers and archers and horses to protect him in the afterlife. When he died in 210 B.C., they were sealed underground with him. There are thousands of them, and most of them are still hiding in the soil. Experts estimate that there could be 8,000 soldiers when all have been found — maybe more. That will take a long time, because even though excavation still continues, the archeologists have some obstacles to overcome, like the hordes of tourists who show up by mid-morning every day. Scientists are also trying to figure out how to resurrect the soldiers without damaging the delicate paint on them. When it’s exposed to air, 2000-year-old pigment doesn’t hold up very well — it rapidly fades or peels. That brings up another incredible thing about these warriors: every one is unique. This was no assembly-line job; each was hand-painted and the facial features are different on all of them. Back in the day, an estimated 700,000 people from all over the empire were put to work creating Qin’s Mausoleum. Craftsmen who weren’t involved in that project were pressed into service on another of his grandiose schemes: He began construction of what eventually became known as the Great Wall of China. Emperor Qin did not lack for big plans. Today the site where the discovery was made has become a sort of campus; there are several buildings, the largest of which encloses Pit Number One, where over a thousand warriors have emerged so far. It has a domed roof that reminded me of an aircraft hangar (see photo). In another building there is a display of terra-cotta chariots and horses and armor, found in other pits. There is also a 360° movie theater that runs a short film. It’s about highlights of Qin’s reign, I think — the film was seriously out of sync and appeared to have been run through a paper shredder. Maybe they’ve fixed it since we were there, but if not, close your eyes during the screening so you don’t get queasy. There is also a nice gift shop on the grounds; you can buy reproductions of warriors, or of coins and other stuff found during the excavations. There are also books for sale about the Terra Cotta Army, and if you buy one, an old man at a table will autograph it for you. He’s sort of a local celebrity — he’s one of the farmers who made this fantastic find. This entry was posted in Art, History, Travel and tagged China, Emperor Qin, terra cotta warriors; Xi'an. Bookmark the permalink. I hadn’t noticed that group of people before, but it very well could be you. The two of you made it into a lot of photos from our mutual adventure! It’s well worth putting on your list of future travel plans, Victor. Having seen your blog, I know you have already been to a lot of wonderful places. Perhaps someday Xi’an, China, will be among them, too!